As promised on the Inside Adwords blog, Adwords accounts are now showing Quality Score data for each ad and its keyword. I first noticed the Quality Score data across all of my active accounts yesterday. Each ad and keyword’s Quality Score shows its status – whether the ads are showing or not as well as its numeric Quality Score. I have found Adwords Quality scores ranging from 9 down through 2. 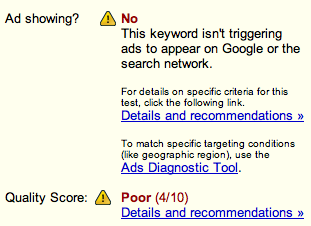 I am not sure whether Adwords assigns a Quality Score of 10 to any ads and keywords performance. Nor am I sure whether they score any ad and keyword below 2. If Adwords does, I haven’t yet found any examples to share. Within the new Adwords Quality scoring system, ads and keywords which score 9 and 8 are considered “Great”. Ads and keywords showing 7, 6 and 5 are “OK”. 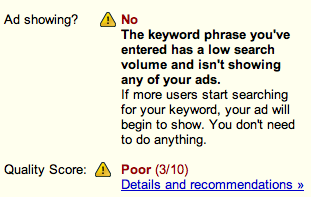 Ads and their keywords with Quality scores of 4, 3 and 2 are considered “Poor”. I have found examples of OK Quality Scores where the ad and its keywords weren’t being shown for numerous reasons. 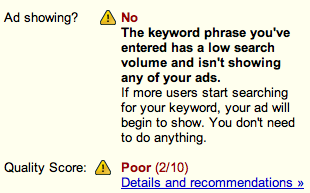 Additionally, I have found examples of ads and their keywords being shown while still having a Poor Quality Score. Having numeric Adwords Quality Scores for each ad and keyword will surely help Google Adwords deliver more relevant and targeted advertising while also helping their advertisers score more targeted search traffic. As I mentioned in my last post, Google has begun taking additional steps to bridge the gap between web search traffic and their advertiser’s foot traffic. In researching the different types of Local OneBox results found both here in the United States and abroad, I found an Adwords ad format I hadn’t yet seen – an Adwords Ad with a Google Maps icon embedded within the Google Adwords advertiser’s ad. By adding Google Maps images to local advertisers ads, Google has simplified and reduced the searching online to visiting off line and in person to three steps. The search for “Oklahoma City Web Design” produced the usual sponsored links both those above the new 10 OneBox results and those found along the right rail. However, after closer inspection I noticed the second listing had a maps icon embedded in the ad. Step 2. Local product or service providers advertisement selected. Selection factors could include brands or services offered and their convenience to the searcher. Step 3. After placing a call to the advertiser to verify their products availability and price, the searcher can then complete the three step process from searching online to buying off line by then getting directions to the advertisers location through Google Maps. By adding the Google Maps feature to local Google Adwords advertisers ads, Google has bridged the gap between web search traffic and foot traffic in a fresh, unique and beneficial way. As reported and since confirmed by Greg Sterling, Google is now showing up to 10 local business results for geographic specific queries. Google told Greg the reason it’s showing more links is because usability testing revealed that many people didn’t realize there was additional local content available beyond the three listings, despite the “more results . . .” prompt. Accordingly, Google said that with the 10 links it is hoping to signal people that there is much more local content a click away. Google also said that it wouldn’t always show 10 results; it might still show three sometimes or one if the query is very specific. As Mike Blumenthal has noted, it has been nearly a year since Google last upgraded their Local OneBox. At the time it led to a significant increase in Google Maps usage. It will be interesting to see if and how Google’s worldwide roll out of their new Local OneBox increases Google Maps usage like it did after implementing their last Local Business OneBox changes. In my previous post about Google’s local business results being expanded, I wrote about how the listings appeared locally and some of the factors I thought contributed to the listings. Since Google doesn’t publish exactly what factors influence their list, all we can do is study what they publish and draw our own conclusions as to which variables may matter the most. The following are examples of searches I have ran, Google’s Local OneBox business results and my analysis of what variables I think generated the list. This query for a service (internet marketing) followed by the location (Oklahoma City) produced a “top of page” 10 listings OneBox result. I also found some Google Adwords ads displaying the recently discovered business address on the fourth line of the Adwords ad. 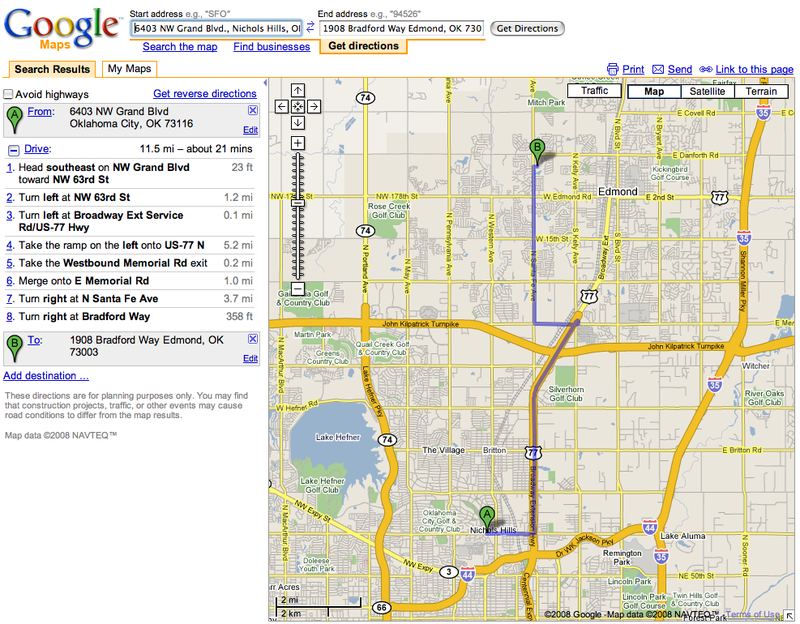 Searching for the same terms in a different order; placing the location first (Oklahoma City) and the service (internet marketing) last, produced a OneBox result with only three business listings. 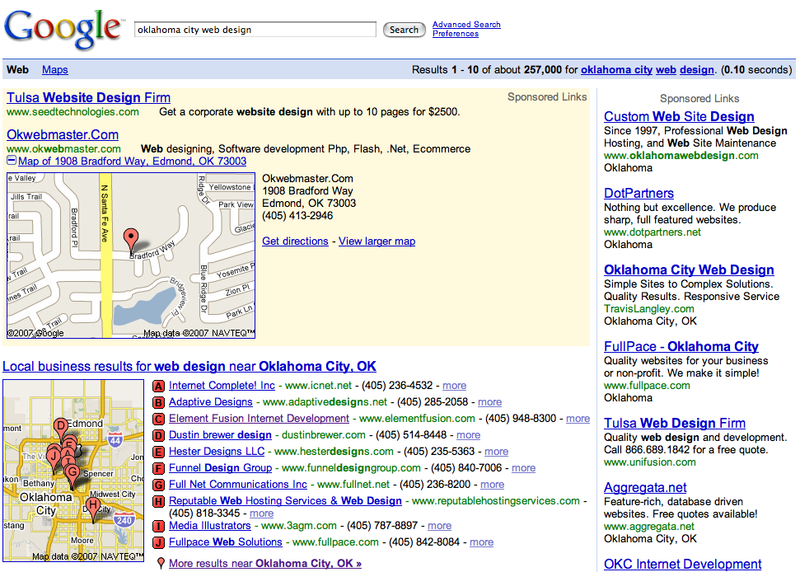 Some local Adwords advertisements still appeared with their specific address on the fourth line, which as mentioned previously only displayed a city or state. A slightly different search for a similar business category yields a new clue to at least one of the factors Google uses to generate its OneBox 10 local business listings. A search for the service (business marketing) and the location (Oklahoma City) produces a different yet seemingly innocuous list of businesses. However, in this particular query and in addition to the expected listing for my business “Advanced Marketing Consultants” appearing, “Cohn, Tim” also appears as one of the results. Cohn, Tim is one of my business phone listings in my local Bell telephone directory. The phone company apparently can’t sort and digitally publish business listings with an individual’s name like they can an individual’s residential phone data. I haven’t investigated whether the phone company automatically reverses residential phone records before they are published to the web or whether Google reverses the data before they publish it. Regardless, it looks like the business listing for “Tim Cohn” will remain forever memorialized in the vast telephone company data and its Internet counterpart as the business listing: “Cohn, Tim”. Having accepted the fact that the telephone company seemed incapable of changing their listing results years ago, I decided to turn this particular piece of flawed data into my “control”. When Cohn, Tim appears in print – whether online or off – its source is always local phone company data. Thus at least a portion of this particular Google local OneBox list origins lies in business telephone directory data. To its credit, Google has become proactive in allowing users to modify incorrect Google data as Barry Schwartz recently reported. And unlike my attempts to get the phone company to correct how my business phone listing appears both in print and online, I am sure Google will let me append my business listing in their Google Local Business Center, but that will have to be the subject of another post. 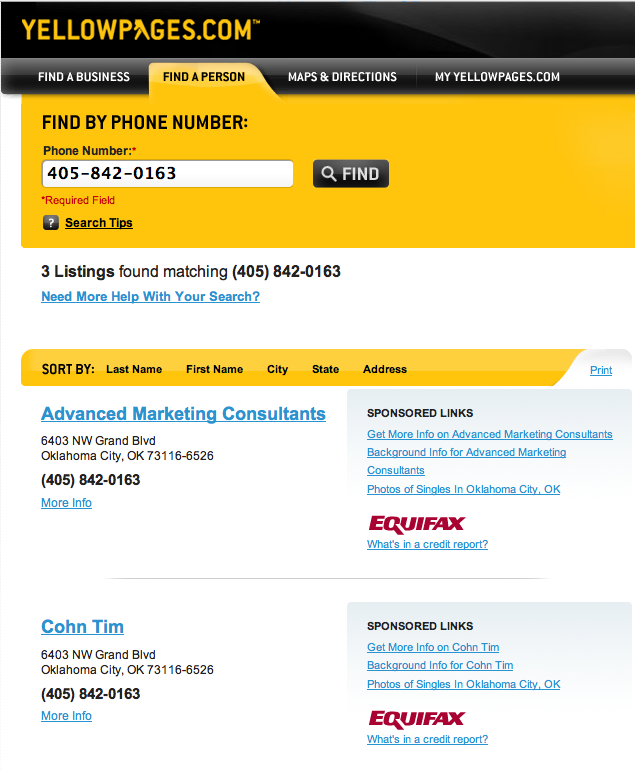 Unlike with an old fashioned yellow pages search for listings with “Chevy Oklahoma City” keywords whether in the yellow pages or through directory assistance, Google can return results most likely relevant and matched to the searchers or callers intent. Whereas, a yellow pages search or directory assistance call would take a couple of “passes” to yield the similarly accurate and desired result – businesses listings most likely to be known as “Chevy Oklahoma City”. If the telephone company can’t arrange and organize my single business listing correctly in their digital directories, how will they ever be able to compete with Google’s ability to anticipate and even provide multiple possible answers to each searchers question? Google’s local business results aren’t just appearing in the US. 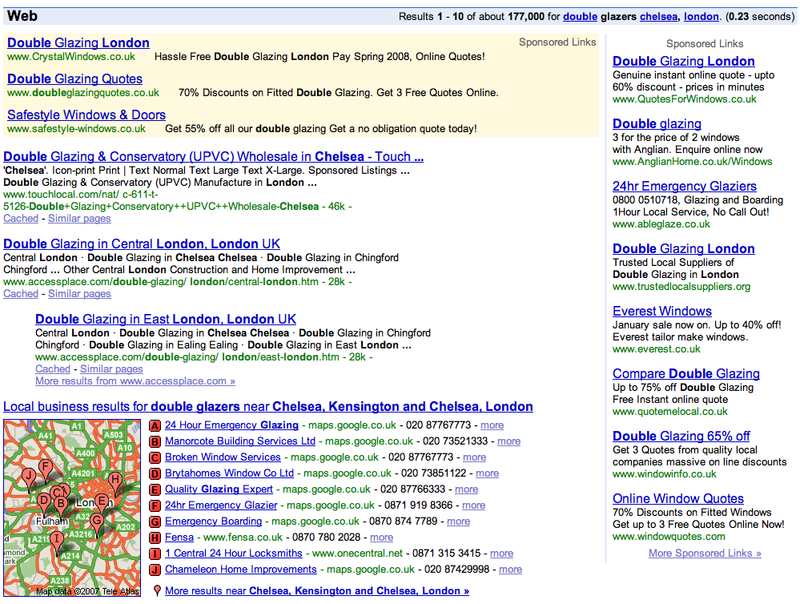 A search for “double glazers” in the Chelsea section of London produces a list of double glazers midway down the search engine results page. I am not sure why some OneBox results appear at the top of the page and why others appear in the middle of the page but I believe it too must be based on Google’s understanding of the searchers intent. This search in Sydney, Australia for travel agents also produces a OneBox result. 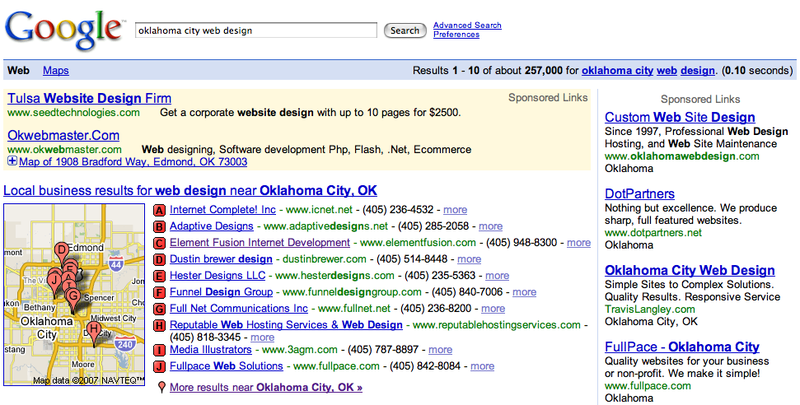 Here the OneBox appears again at the top of the page above the organic results.